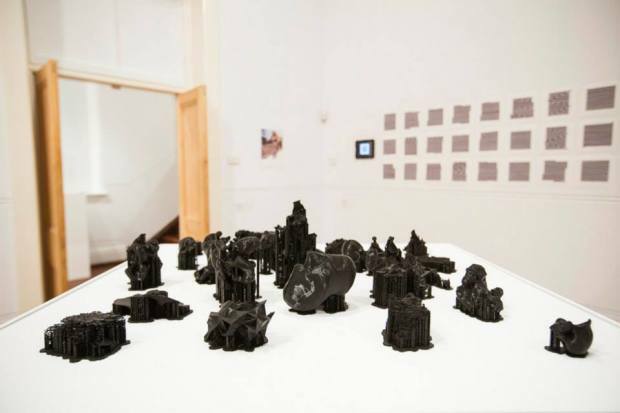 city constructed from sleeping brain activity data was judged Highly Commended at the Fremantle Arts Centre Print Award 2014. This set of sculptures was created using data collected from sleeping brain activity that has been converted into 3D meshes, rendered using computer software and then printed. This data presents a non-narrative view of the thought activity occurring in sleeping individuals. Abstract relationships are formed – the constructed ‘buildings’ are at times peculiar, dark and dream-like, and other times reminiscent of modernist architecture, drawing links between abstract/subconscious thought, creativity and conversions between media. The work is inspired by Carl Jung’s writings surrounding dreams and the commonly expressed view that the internet is a repository of outsourced information, thoughts and memories. This work addresses this idea by procuring this data from the expanse of the internet and connecting multiple individuals’ brain activity to form a 3-dimensional array, linking the collective unconscious of the internet with sound, video and physical structures.